On Friday, September 9, is Hurricane Katrina Relief Drive Night at Retama Park. The drive is to aid victims evacuated from their homes due to Hurricane Katrina and relocated to the San Antonio area. Donations can be made in the Retama Park grandstand. Cash is also requested as Food Bank officials report $15 of food can be purchased for each $1 donated. Please do not bring glass containers, homemade food, or clothes. 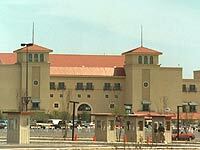 Retama Park patrons who bring relief times receive free admission Friday night. The Texas Horsemen's Partnership encourages all horsemen and racing fans in the San Antonio area to participate in Retama Park's Hurricane Relief Drive Night. Your donations will be greatly appreciated.